When it comes to choosing from the many different types of succulents to include in your house or garden – there is a huge choice. There are spiky ones, soft ones, pretty ones and even succulents with medicinal properties. So which do you choose? This is a list of our favorite succulents that are suited to be placed primarily indoors, but also in a garden if that’s what you prefer. 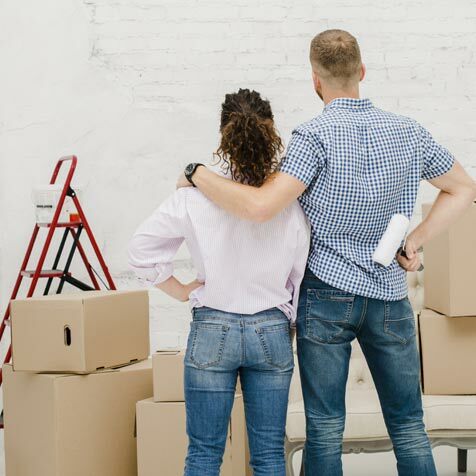 So browse through this list and hopefully you will find some inspiration as to what would look great in your home. In a hurry? Our favorite succulents are listed below – just expand the box, otherwise keep scrolling past to for an in depth guide. 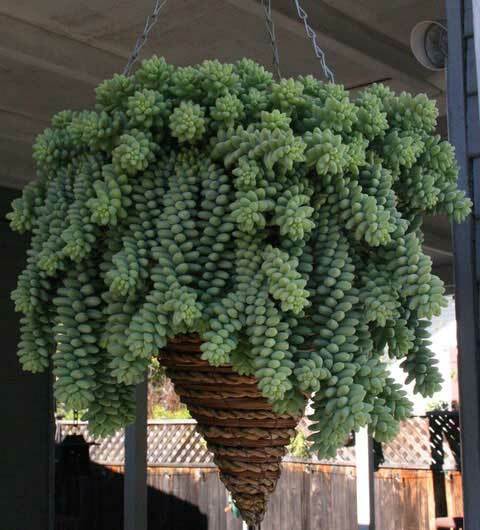 Burro’s tail is one of the most popular types of succulents for good reason, place it in a hanging basket and it is simply beautiful. 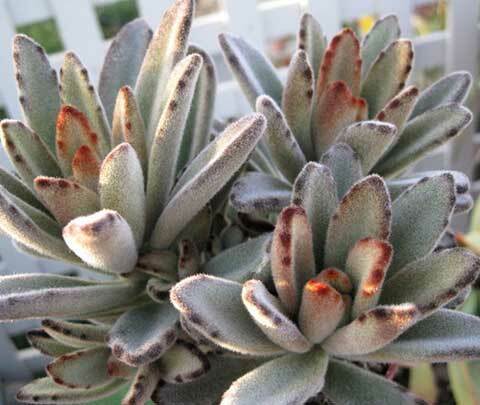 It is a trailing succulent plant and the gray-green or gray-blue leaves overlap each other and grow up to 3 feet long! This creates a long dropping tendrils and it will really catch the eye. This plant is native to Mexico and thrives in medium-high light conditions. Burro’s tail prefers low humidity and its ideal temperature range is about 68 degrees F.
Burro’s tail is especially low maintenance even for a succulent plant and only needs to be fed a low nitrogen fertilizer once or twice a year. The succulent plant known as the Christmas Cactus is part of the Shlumbergera genus of cacti. This comes in a few different varieties, but the one we will be talking about today is from the Buckleyi Group. It is a lovely plant which has symmetrical flowers which hand down below the horizontal. As with most types of succulents, the Christmas cactus doesn’t like to be over watered. You need to allow enough time for the top 2-3 inches of soil to dry out between watering and let it go even dryer in winter. It does best in medium – high light and likes to be fed regularly (3 times) in the summer with a 10-30-10 fertilizer. To get your Christmas cactus to flower, there are a few easy steps you can take. 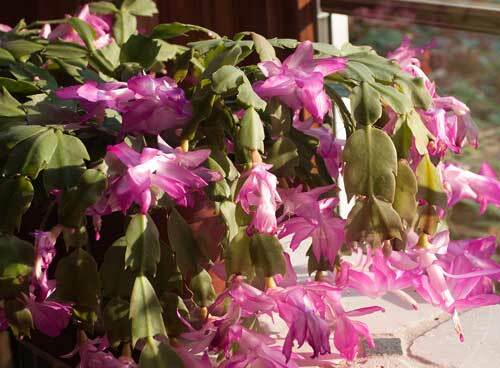 See our guide on how to get your Christmas Cactus to bloom here. If there is one type of succulent that everyone has heard of, its Aloe vera. It’s healing sap have been used for centuries to treat many different things, The ancient Chinese and Egyptians would use Aloe Vera sap for the treatment of wounds and sunburn. Use of this versatile plant as a treatment continues today! You can find more details on these uses here. The soil should be allowed to dry out completely between watering. Keep the Aloe vera plant in direct sunlight as this is what it thrives on. If direct sunlight is not available, as much light as possible should be ok. In summer you should fertilize this plant 3 times with a 10-10-10 fertilizer. Do not fertilize in winter. 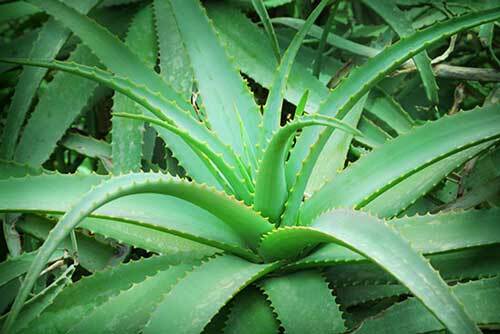 In our opinion, everyone should have an Aloe vera plant as they are quite easy to grow and have a myriad of uses! The next in our list of the different types of succulents is the Jade Plant. You have probably seen it around somewhere, because it has been popular for a long time now. The reason behind this long term popularity is that it is so easy to grow. 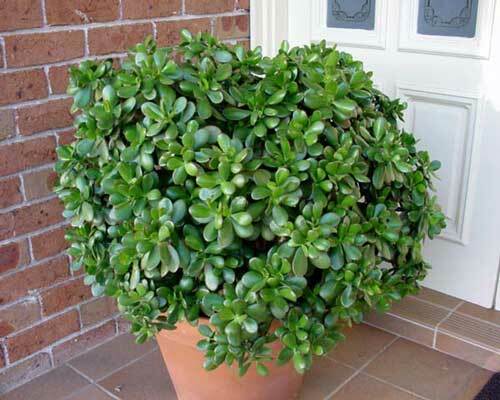 The Jade plant has thick stems that are covered in glossy green leaves with a bit of red. The leaves are also quite thick. These plants are hungry in the summer and should be fertilized three times with a 10-10-10 fertilizer. 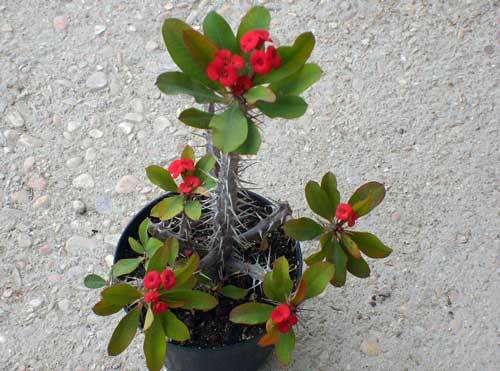 The plant is quite top heavy so you will want them in a terracotta pot, this also allows for better air movement through the soil which the Jade Plant loves. You will want to allow the soil to completely dry before watering this type of succulent. Do not over water these plants, as they are very susceptible to it and will easily die if you do. It is likely that you will want your Jade Plant to be symmetrical as being one sided can cause it to fall over, so prune it as required to keep it so. Crown of Thorns can flower for 12 months of the year if given the right amount of light, so they are perfect for anyone who always like to have a bit of color around. It should be noted however that this type of succulent has a skin irritating sap – so make sure you wash your hands properly after handling. The branches a quite spiky, and the leaves are long and spoon shaped. The flowers are quite small and usually cluster together. If the plant is flowering, you should only allow the top inch or two of soil to dry between watering. This type of succulent is a little thirstier than most others when in bloom. However, if the plant is not in bloom you should let the top half of the pots soil dry out before watering it again. If you let the Crown of Thorns dry out too much, it will drop its leaves – but don’t fret, if this does happen then new ones will grow a few weeks after being watered. Remember – these plants are tough! Crown of Thorns succulent plants prefer direct sun for flowering, but it can survive just fine in medium light conditions. Crown of Thorns this hungry plant three times in summer with a good succulent fertilizer. The Panda Plant is also one of the most well known types of succulents. It has green leaves which are quite thick and are covered in a coating of tiny silver hairs that are quite soft. This give the plant a blueish/grayish appearance. The edges of the leaves have a bit of a rusty look as they have spots of brown. This succulent plant is grown primarily because of this foliage type. When it comes to watering, let the top two inches of soul dry out before you water it again. When winter comes around, only give it a drink to keep the soil from completely dying out. The Panda plant prefers medium- bright light and filtered light is best. Once again, these types of succulents love a 10-10-10 fertilizer three times in the summer. While we have given a few tips in this article about how to care for each of the different types of succulents, there are some overarching rules that one can go by when caring for their succulents. To learn how to care for succulents see our extensive guide here. Looking for cold hardy succulents? Check out this article.